Steak can be a little bit scary for those just starting to grill. It's expensive, unforgiving and it isn't always easy to tell when it's finished cooking. With these tips, not only will you be able to cook a steak, but I'm willing to bet the end results will be delicious too. 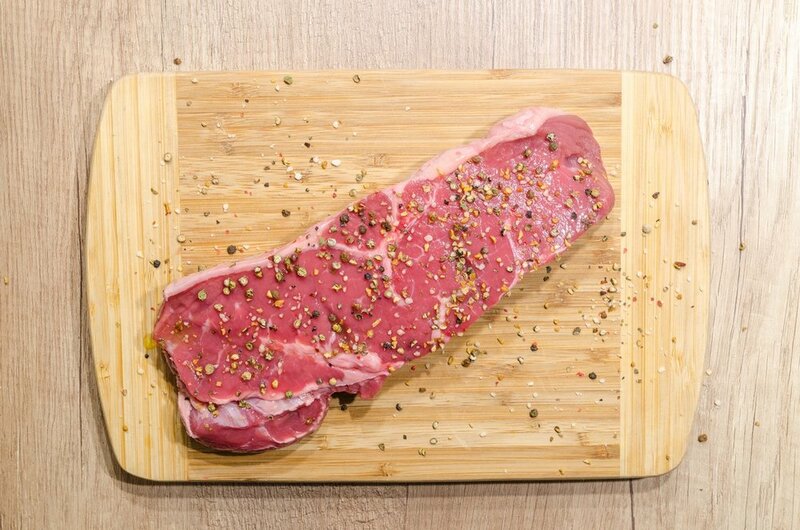 Although it may be obvious that to make a great steak you need to start with a great raw product, but you may not know exactly what type of meat to buy. This is a common question, and we’re here to help you out. When you go to a restaurant and order the steak that puts a dent in your wallet it is most likely going to be USDA Prime beef. This is the most expensive type of beef in America and is also the highest quality you can find. If you can find USDA Prime beef at your grocery store or butcher consider yourself lucky, since this accounts for only 2% of the beef production in the US. If this isn’t an option where you live, don’t worry. Choice grade beef steak can be found at almost any grocery store and is still very high quality and will make a great grilled steak. People always say it, but I’ll say it one more time. Make sure that you have all the ingredients and tools that you need within an arm’s reach before you even place that steak on the grill. Once the fire is roaring and the steak is cooking every single minute counts. You don’t want to realize that you left the butter in the refrigerator when you go to slather it on the steak. For this reason, make sure that you have all of your ingredients, your tongs, two plates (one for raw meat and one for cooked meat), a meat thermometer if you wish and anything else you think you might need for the next 15 or so minutes right next to you. There is an age old argument about whether you should oil the grill or oil your meat. Well, we found the perfect solution. Not only should you oil the grill every time, there’s a way to make sure that every single inch gets coated easily and evenly. Find an old clean hand towel that will now become your “grilling towel”. Roll the towel and wrap 3 rubber bands around it. Cover one side of the towel in oil and use it to oil your grill. The best part is that you can reuse the towel every time you grill if you clean the grate first. As for oiling the meat, there's a time for that, too. What is a steak, if it isn’t full of mouthwatering flavor? That’s a trick question. 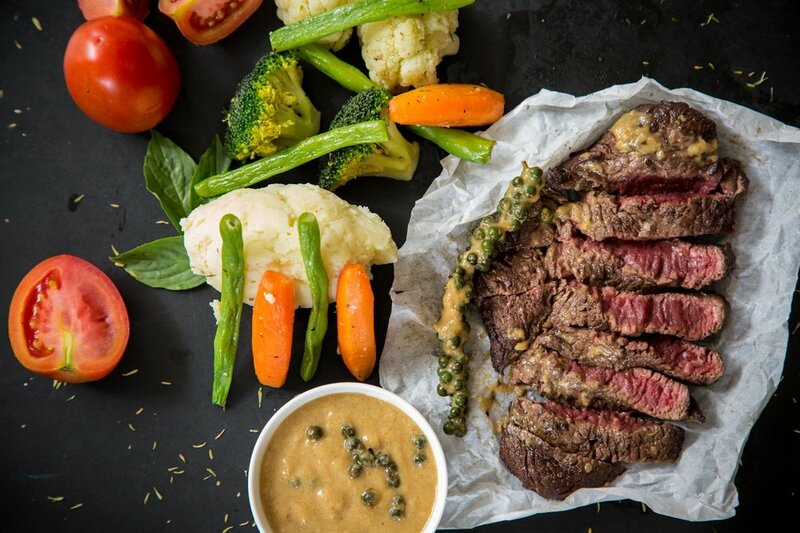 Every steak, when cooked correctly should make your mouth water, whether it is from a simple mix of salt and pepper or an elaborate array of seasonings and flavors. When making steak, we like to coat the steak with a small amount of olive oil and then add a coating of Josephine’s Espresso SteakBlend. Don’t forget that you will need to continuously add blend to the steak throughout the cooking process, as a decent amount of the blend will fall off and into the flames. Some other ingredients that can be used to enhance the flavor of your steak include fresh garlic and herbs. By cutting a garlic clove in half and rubbing it on the outside of your steak you not only create some fresh flavor, but also an incredible aroma. If you would like to add the subtle flavor of fresh herbs to your steak you can make an “herb mop” by tying a bunch of herbs to a wooden spoon and coating them in olive oil. Use this mop throughout the cooking process to baste your steak and add even more flavor. Yes, that’s right – butter. For many people, butter is the last ingredient that you would think to add to your precious steak, think again. Butter is the perfect ingredient to help you create a golden brown caramelized crust on the outside of your steak. For this process grab a whole stick of butter. Don’t worry, you don’t have to use the entire stick, it is just easier to handle this way. Once you place your steak on the grill cover the side facing up with a nice slather of butter. When you flip the steak cover the other side. Repeat this one more time if necessary. The great thing about butter is that it will not drastically affect the flavor of the steak. This is because the meat will not absorb the butter like other foods, but instead will fuse with the fat from the steak to create a mouthwatering crust. Many people don’t think much about the tools that they use when it comes to flipping a steak, if it flips and doesn’t overcook, right? Wrong. Using a fork or other type of sharp object to flip your steak puts holes in the precious outer crust and lets the juices escape. This is absolutely the opposite of what you want to happen. Do yourself and your mouth a favor and grab a pair of sturdy tongs. Use these when flipping the steak and only put holes in your steak if you absolutely must (testing the temperature is one of the exceptions here). If using a thermometer to test the internal temperature of your steak at the end of cooking, remember that while the steak is resting the temperature will continue to rise. As soon as the steak comes off the grill have a nice “finishing dressing” ready to be prepared on the side. This can be a combination of olive oil, fresh grated garlic, lemon zest, salt and any freshly chopped herbs that you would like to use. Lather this sauce on your steak, cut your steak into slices and roll each piece in the dressing. The steak will absorb these flavors as it continues to increase in temperature while it is resting. We love the savory taste of our Espresso Blend with the deep richness of Sumatra coffee combined with Brown Sugar that provides an ideal caramelized crust for your steak.